The Houston Chronicle posts, "Being pro-life in governor's race doesn't extend to death-row inmates," by Peggy Fikac, the Austin Bureau Chief of the Chronicle's sister-paper, the San Antonio Express-News. When Attorney General Greg Abbott talks about his opposition to abortion, he often mentions his Catholic faith. Not so when he talks about his support for the death penalty, whose abolition is advocated by Pope Francis. Abbott's Democratic opponent, Sen. Wendy Davis, also backs the death penalty - even though as a Fort Worth City Council member in 2000 she voted to impose a moratorium on it, and even though the Texas Democratic Party platform calls for substituting life in prison for capital punishment, saying the death penalty is applied disproportionately to the poor and persons of color. "Questions of Competence," is by Chase Hoffberger for the Austin Chronicle. Eighteen years of appeals are ended. In April, nearly two decades after being sentenced to death by the state of Texas, now-40-year-old Larry Hatten told his attorneys and a Corpus Christi court that he didn’t want to waste any more time with what he considered inevitable. After being declared mentally competent, Hatten was given a final execution date: Wednes­day, Oct. 15. He’ll be the 10th inmate executed this year, and 518th since the reinstatement of Texas’ death penalty in 1976. Houston's KPFT-FM will host Execution Watch on the web and its HD radio broadcast signal beginning at 6:00 p.m. (CDT), Wednesday. According to TDCJ, state district courts have scheduled one more execution for 2014, and eight executions have already been scheduled for 2015. More information is at the World Coalition website. "UN marks World Day against Death Penalty with strong calls to end ‘cruel practice’," is the news release issued by the United Nations News Centre. The continuing application of the death penalty is a “cruel practice” that undermines human dignity, United Nations Secretary-General Ban Ki-moon said as he urged Member States to “reaffirm faith in fundamental human rights” and impose moratoriums on executions. In a video message issued to an event that took place yesterday at the UN Office in Geneva to mark the annual observance of the World Day against the Death Penalty, the Secretary-General noted that an increasing number of States from all regions of the world had acknowledged the failure of capital punishment as a means to exact justice. The event in Geneva also marked the European release of a new publication produced by the Office of the High Commissioner for Human Rights (OHCHR), entitled Moving Away from the Death Penalty: Arguments, Trends and Perspectives, which places particular focus on the political leadership required to move away from capital punishment. Recently, Equatorial Guinea, Pakistan, and the states of Washington, Maryland and Connecticut in the United States decided to establish a moratorium or suspend executions while last April, El Salvador, Gabon and Poland acceded to the Second Optional Protocol to the International Covenant on Civil and Political Rights – an international agreement aimed at abolition. These countries join more than 160 other Members States who have already either eliminated capital punishment or do not practice it. In a separate message delivered yesterday, Assistant Secretary-General for Human Rights, Ivan Šimonović, celebrated the overall trend towards abolition, adding that support for abolition resonated across regions, legal systems, traditions, customs and religious backgrounds. But, he noted, amid all the successes there have also been setbacks with some States resuming executions after decades and others reintroducing it for certain offences. “In 2013, after many years of slow, but consistent moving away from the death penalty, we have had a 12 per cent increase in the number of executions when compared to 2012, and the number of executing states increased by one,” Mr. Šimonović told those gathered. The Assistant Secretary-General highlighted three specific reasons for abolition which he said were clearly delineated in the OHCHR publication, such as the need to avoid executing those subjected to wrongful convictions; the lack of statistical evidence pointing to the death penalty as a useful deterrent; and the higher rate of execution among those from marginalized communities, including people with mental or intellectual disabilities. “I strongly believe that one day, people will look back and wonder how it was possible that the death penalty ever existed—just like, in most societies today, it is already hard to understand how slavery could ever have been allowed,” Mr. Šimonović concluded. Jurist posts, "UN rights official calls for international abolition of death penalty," by Julie Deisher-Edward. Speaking at the Geneva presentation of a report by the UN Office of the High Commissioner for Human Rights (OHCHR) [official website] Moving Away from the Death Penalty [text, PDF; JURIST report], UN Assistant Secretary-General for Human Rights Ivan Simonovic [official profile] urged the international abolition of the death penalty. UN Secretary-General Ban Ki-Moon [official profile] released a statement [press release] in support of the sentiment, saying "The taking of life is too irreversible for one person to inflict on another. We must continue arguing strongly that the death penalty is unjust and incompatible with fundamental human rights." Simonovic expressed particular concern [UN News Centre report] with the increase in the number of executions in recent years, despite a growing trend internationally toward the abolition of the death penalty [JURIST report]. Currently, 160 countries have abolished the death penalty in law or in practice. "Senior UN Official Calls For Abolition Of Death Penalty," is from by RTT News. As long as the death penalty exists, there will be a need to advocate against it, Assistant Secretary-General for Human Rights, Ivan Simonovic, declared Thursday at the launch of a new United Nations publication aimed at raising awareness on the abolition of capital punishment. Speaking at the Geneva presentation of Moving away from the Death Penalty, Arguments, Trends and Perspectives, released by the Office of the UN High Commissioner for Human Rights (OHCHR), Simonovic celebrated what he said was "worldwide accelerating progress" made towards abolition since the 1948 Universal Declaration of Human Rights. "Back then, 66 years ago, only 14 countries had abolished the death penalty, the majority in South America," Simonovic explained, adding that currently around 160 countries around the world had abolished the death penalty in law or in practice. "Swiss launch joint declaration against death penalty," is from SwissInfo.ch. On World Day against the Death Penalty, Swiss President Didier Burkhalter has launched a joint declaration in favour of death penalty abolition, together with 11 foreign ministers from around the world. “The death penalty is incompatible both with human rights – in particular the fundamental right to life – and with justice systems aimed at rehabilitation rather than retribution.” according to a government statement on Friday. Switzerland is working on this issue at both the international level – namely in the framework of the UN General Assembly, the United Nations Human Rights Council, the Organization for Security and Co-operation in Europe (OSCE) and the Council of Europe – and at the bilateral level, engaging in dialogue with countries that are on the path towards abolition. “The death penalty is irreversible and can lead to wrongful convictions, or even executions. Even in modern and transparent justice systems, human error remains an unavoidable risk,” the statement said. Switzerland has set itself an ambitious goal with the strategy it formulated last year: it wants to promote the worldwide abolition of the death penalty, or at least a moratorium on all executions, by 2025. The full text of the "Joint Declaration of October 10, 2014," is below. It's available in Adobe .pdf format at the link. As we mark the 12th World Day against the Death Penalty, we jointly call for a world which respects human dignity. The death penalty, one of the most complex and divisive issues of our time, continues to question the fundamental values of our societies and to challenge our understanding of criminal justice. We respect the views of those who still support the use of the death penalty, and we believe that everyone has a right to be protected from violent crime. However, we consider that state executions should not be taking place in the 21st century. Modern justice systems must aspire to more than retribution. 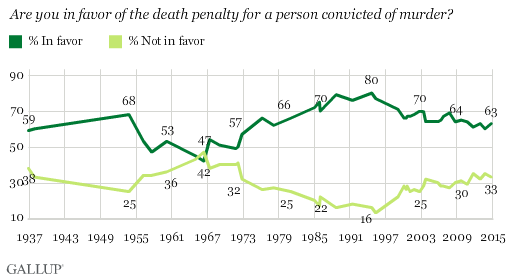 The main objections to the death penalty are well known. Despite popular belief, there is no evidence supporting the claim that executions deter or prevent crime. No justice system can ever be guaranteed free from error, meaning that death sentences may cause the innocent to be put to death. Often, capital sentences are disproportionately imposed on poor, vulnerable and marginalised persons, aggravating discrimination against the weakest in society. Finally, the capital sentence provides victims of crime and their families neither with commensurate compensation nor with spiritual relief. On the contrary, state killing results in more hatred and violence - the exact opposite of what modern justice systems should be trying to achieve. This joint call, which we address to the world at large, is the first ever launched by Foreign Ministers of both abolitionist and non-abolitionist States. We recognize that exchange and cooperation are needed to move together towards more effective and more humane justice systems. Together, our countries have the experience and the drive to turn the death penalty into a sentence of the past. A vast majority of countries already supports worldwide death penalty abolition; we hope that all countries will soon join this trend. Related posts are in the abolition and international category indexes. Capital punishment is not a theoretical concept for me. I have murdered five human beings for a state. • It does not act as a deterrent. • It is costly (for example, California has spent more than $5 billion for 17 executions). • It is not applied to the most egregious cases. • The criminal justice system that administers it is extremely imperfect; over the past decade, nearly 150 death row inmates have been exonerated. • It is illogical for the state to teach citizens not to kill by killing. The final reason for my opposition is a particularly personal one—the heavy toll capital punishment exacts from the individuals who have to carry out the sanction. Corrections officials are expected to commit the most premeditated murder imaginable. You follow a policy book and even have rehearsals. Related posts are in OpEd and silent actor trauma category indexes. "How Alabama executes," is the Anniston Star editorial. If the state of Alabama is going to execute condemned prisoners, it must be upfront and transparent about the process. Today, that’s not happening. Until that changes, Alabama and its embattled Department of Corrections carries the stench of a government that wishes the public didn’t have a right to know how it plans to kill those on death row. On Tuesday, Star reporter Tim Lockette outlined the situation of inmate Thomas Arthur, 73, who has been on death row since 1983 for the murder of Troy Wicker of Muscle Shoals. Arthur’s execution has been delayed as Alabama, along with other states that execute prisoners by lethal injection, dealt with a shortage of the necessary drugs. Stocked with its new three-drug execution cocktail — an anaesthetic, a drug that relaxes the muscles, another drug that stops the heart — Alabama is on the verge of resuming executions. Problem is, the state hasn’t revealed the protocol it will follow when executions begin again at Holman Correctional Facility in Atmore. Today's Cleveland Plain Dealer publishes the editorial, "Death penalty protocol in Ohio needs light, not darkness." Draft legislation that would allow providers of lethal injection drugs to remain anonymous and that would indemnify doctors assisting with state executions from censure by their state licensing boards is emanating from Attorney General Mike DeWine's office. What's next, allowing the execution team to wear masks? This latest step in Ohio's death penalty dance -- stemming from a series of missteps that have put the state's execution protocol under examination by a federal judge – will push Ohio even further into the dark ages. Earlier coverage from Alabama and Ohio, at the links. "Selfies Against the Death Penalty," is Rena Silverman's post at the New York Times' Lens blog. There are images at the post. Marc Asnin’s latest project follows in the tradition of documentary photographers crusading for social justice. He just happens to employ selfies in his mission. Through crowdfunding and social media, he has initiated a campaign in conjunction with the VII association against the death penalty in which he asks photographers to upload self-portraits to a website with a caption of 140 characters or fewer describing why they oppose capital punishment. The campaign, “Photographers Selfie Against the Death Penalty,” is part of a larger project, a book called “Final Words,” which compiles 517 final statements of Texas’ death row prisoners. Their final words are combined with mug shots, summaries of the crime for which they were convicted and other details about the prisoners. Mr. Asnin hopes to get the book into classrooms in the 32 states that still have the death penalty on the books. He also intends to mount a traveling exhibition by the fall of 2015 that will include a multimedia projection. Earlier news of Final Words is at the link. Related posts are in the books and culture category indexes. Today's Columbus Dispatch reports, "DeWine: Executions on hold until legislators change law," by Alan Johnson. Ohio will not resume executions next year unless legislators enact two key changes in state law, Attorney General Mike DeWine said yesterday. “You’re not going to see a death penalty take place until the General Assembly takes action,” DeWine said during a joint meeting with David Pepper, his Democratic opponent in the Nov. 4 election. The session with Gannett newspaper editors in Ohio was streamed live on the Internet. The execution issues deal with providing anonymity for “compounding pharmacies” and immunity protection for physicians who help the state with legal support for executions, DeWine spokesman Dan Tierney said. Tierney said DeWine thinks two pieces of legislation, not yet final, must be passed in order to meet stipulations set down by U.S. District Judge Gregory Frost. Frost halted all lethal injections in Ohio until early next year because of concerns about the drugs and how they are used. "Ohio Attorney General says new death penalty laws needed to enable executions to resume," is AP coverage via the Daily Journal. DeWine, a Republican running for re-election, said Monday during a Gannett editorial board meeting that a law is also needed to provide immunity to doctors who provide "legal support" in the execution process such as consulting on drug dosage amounts. Executions are on hold until February after a federal judge temporarily stopped them as questions mounted about the effectiveness of Ohio's new, two-drug execution process. A spokesman for DeWine's Democratic opponent, David Pepper, says future legislative proposals on the death penalty should get thorough and thoughtful consideration. Also in Ohio, WOSU-FM posts, "Anti-Death Penalty Group Plans Central Ohio Forum," by the AP. The state’s leading anti-death penalty group plans a series of forums this week to publicize the work of a Supreme Court panel that reviewed the state’s capital punishment law. The panel’s final report includes recommendations that proponents say could reduce the role of race in capital punishment along with disparities in death cases by county. Ohioans to Stop Executions is planning evening events Tuesday in Columbus, Wednesday in Wilmington and Thursday in Springfield. Earlier coverage from Ohio begins at the link. You can also jump to news of the Joint Task Force to Review the Administration of Ohio's Death Penalty, with links to the Final Report & Recommendations and the Dissenting Report of the Joint Task Force. The Birth of American Law: An Italian Philosopher and the American Revolution tells the forgotten, untold story of the origins of U.S. law. Before the Revolutionary War, a 26-year-old Italian thinker, Cesare Beccaria, published On Crimes and Punishments, a runaway bestseller that shaped the Declaration of Independence, the U.S. Constitution, and early American laws. America’s Founding Fathers, including early U.S. Presidents, avidly read Beccaria’s book—a product of the Italian Enlightenment that argued against tyranny and the death penalty. Beccaria’s book shaped American views on everything from free speech to republicanism, to “Life, Liberty and the pursuit of Happiness,” to gun ownership and the founders’ understanding of “cruel and unusual punishments,” the famous phrase in the U.S. Constitution’s Eighth Amendment. In opposing torture and infamy, Beccaria inspired America’s founders to jettison England’s Bloody Code, heavily reliant on executions and corporal punishments, and to adopt the penitentiary system. The cast of characters in The Birth of American Law includes the usual suspects—George Washington, Thomas Jefferson, John Adams and James Madison. But it also includes the now little-remembered Count Luigi Castiglioni, a botanist from Milan who—decades before Alexis de Tocqueville’s Democracy in America—toured all thirteen original American states before the 1787 Constitutional Convention in Philadelphia. Also figuring in this dramatic story of the American Revolution: Madison’s Princeton classmate William Bradford, an early U.S. Attorney General and Beccaria devotee; John Dickinson, the “Penman of the Revolution” who wrote of Beccaria’s “genius” and “masterly hand”; James Wilson and Dr. Benjamin Rush, signers of the Declaration of Independence and fellow Beccaria admirers; and Philip Mazzei, Jefferson’s Italian-American neighbor at Monticello and yet another Beccaria enthusiast. In documenting Beccaria’s game-changing influence, The Birth of American Law sheds important new light on the Constitution, the Bill of Rights, and the creation of American law. Bessler is an Assocate Professor of Law at the University of Baltimore. He has written extensively about the death penalty, including Cruel & Unusual. You can also jump to other news involving Bessler. If the name of Cesare Beccaria seems familiar to loyal readers, it may be because of this Maryland post from last year. "Executions wrong direction for Tennessee," an OpEd by Fran Rajotte for the Tennessean. She's chair of Caritas: Voices for Peace Life and Creation, a ministry of St. Matthew Church in Nashville. As the summer comes to a close and fall begins, I have become even more concerned about the string of executions Tennessee is planning over the next couple of years, beginning in October. Why is Tennessee, a state that has only executed six people since 1960, moving in this direction? With public support of the death penalty at a 40-year low and with more and more voices speaking out against the death penalty, it seems that Tennessee is out of step. Eighteen states no longer have the death penalty, and states including Delaware and New Hampshire are getting closer to repeal. Even Colorado’s governor recently stated that he now opposes the death penalty. This growing support for repeal comes as those most impacted by this broken system are raising concerns. A growing number of victims’ family members do not believe that the death penalty provides swift or sure justice, and in fact, keeps them stuck in a moment in time, not addressing their ongoing needs.